Little D has been an o-k sleeper. He had 20 minute cat naps as a newborn and I was always envious of people who had babies that slept for hours. His mutant hearing made us start using a noise machine in his room. All in all, however, he hasn’t caused us too much grief – until he hit 10 months of age. At 10 months old he decided he was going to put up a big stink when going down at bedtime. He also decided I was the only one that would be able to give him his bedtime bottle, and put him down. Bedtime was always a task that was equally shared between my husband and I. During a recent doctor’s visit, we mentioned our baby’s recent changes in sleep routine. She asked if he was sleeping through the night. We explained that he slept most nights but would experience night wakes once or twice a week. We also said that when he would wake in the middle of the night we would give him a bottle and put him back to bed. He would always fall asleep without any issues. His doctor recommended cutting out the bottle he gets during his night wakes. She explained that he was old enough and healthy enough not to need one. I will be honest, not giving him a bottle during night wakes hadn’t even occurred to me. I had been operating on mommy auto pilot. When we got home from the doctor’s appointment I didn’t even know where to begin. My sister-in-law used an infant sleep consultant with her little one and had tons of success. I decided to email the consultant to see if I could get advice about Little D’s sleep issues and tips on how to eliminate the ‘night wake bottle’. His issues were really minor and I figured we could get them resolved pretty quickly. We had planned to start using the techniques the consultant outlined over the May long weekend. This didn’t go as planned. Little D came down with a cold, and I decided it was best to abandon the sleep training until the following weekend. BIG MISTAKE. The long weekend was horrible. Little D was sick, and decided to skip one nap a day entirely. He was cranky when he was awake (because he was tired from skipping his nap). Since the weekend he has taught himself a new trick. 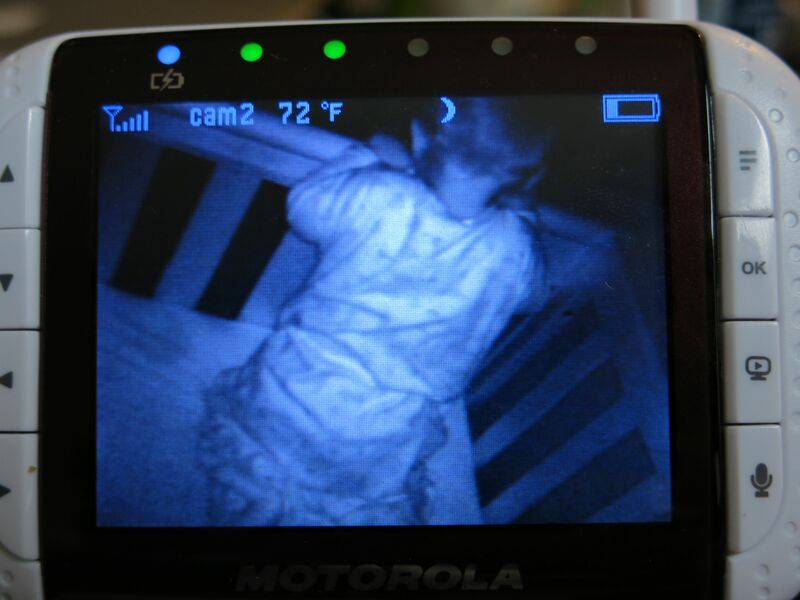 Yesterday he figured out how to pull himself up to standing in his crib. We have since lowered his crib to the lowest position. Now we have the added bonus of him crying in protest from an upright position. Sleep training IS starting this weekend. The downward progression over a matter of days has been unbelievable. My quick emails about minor sleep issues have transformed into requiring a full blown sleep plan by a consultant. Hopefully we can get Little D back on track and restore sanity to our house once again. I am in the same boat! My son sleeps through the night about 2-3 times a week so I know he can do it! When he does wake up crying I am just like you…mommy autopilot. I grab a bottle, feed him and he goes right back to sleep until the morning. Just recently it dawned on me that he obviously doesn’t need this night time bottle so I have tried reducing the amount. Rather than a normal 4 oz bottle the past two nights I have him 2 oz. If he wakes up tonight I will try to not give him any at all. Good luck with your sleep training! I must confess..I like the idea of taking the easy way out. lol Bottle and bed has always worked for night wakes. I’m dreading the sleep training, but I know it’s necessary at the same time. Good luck on Landon’s first night wake without a bottle. Maybe it will be a smoother transition than you think. Keep me updated!